Armed with lances, swords and shields, the World Tournament of Champions Joust Troupe presents jousting, sword fighting, and games of skill for Her Majesty’s pleasure. 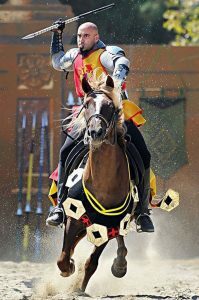 The World Tournament of Champions features an experienced and professional team of Knights that collectively have been entertaining the masses for decades. Crossing lances is only the beginning of the fun and excitement this group delivers. Will the Spanish Knight claim victory for his homeland from the English Knight, or will the Scottish Knight have the last say? The Knights will demonstrate their skill to the Lord Mayor at the 12:00 Tournament of Games. Then join in the company of Her Majesty at 3:00 for the Queen’s Royal Joust. There is no additional fee to attend the tournament. It is included with the general admission ticket.